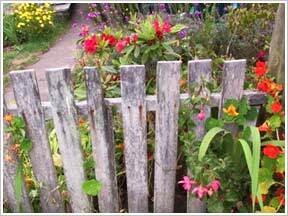 Bamboo fencing or stockade fencing is a quiet popular idea that has long been practiced by garden enthusiast. This type of fencing uses traditional hardwood and softwood boards joined up with no gaps. Bamboos make a reliable and cheap alternative for garden fencing. The thick bamboo reeds lends a suave touch to the surrounding and creates a wonderful harmony with the nature. Garden fanatics sometimes pay good money to create a rustic like patina on new copper and iron fences. You can achieve a similar results by rummaging through salvage yards for used panels. Find out some of the iron panels that have developed a coating of rust. Create an obscure fencing design with the rustic iron panel and cover it with vine for a true visual delight. As garden fencing do not provide structural support like arcades, new bricks are'nt always necessary. Recycled bricks, normally used in the driveways make a perfect choice for garden fencing. The recycled bricks adds a character to the surrounding space with its weathered appearance. Dry stones are the most versatile and cost-effective material for making a garden fences. The abundant stones can be easily laid down without rebar or mortar. Stacking up the hefty stones in a row creates a robust fence with subtle appearance. Maintenance for stone fence is much more simpler, just replace the individual block as required.